I used the stamp "Lettre a mes parents" (script in French) and the stamp "Lutine" (elf) with black Stazon. 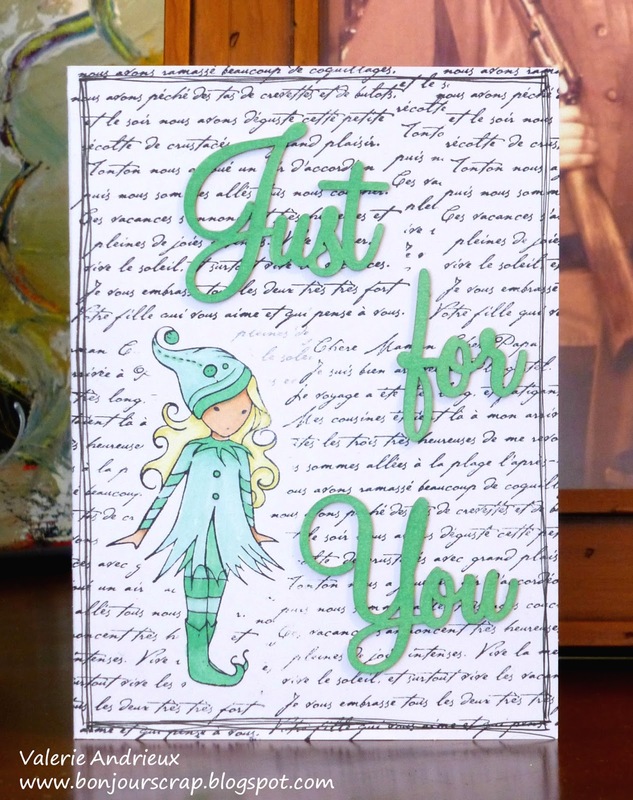 I first stamped the elf on the card, then stamped it a second time on another paper. I cut out the second image and adhere it on the top of the 1st one with removable glue. Then I stamped the text all over the card and remove the 2nd stamp once done. The elf is colored with Copic sketch markers (E00, E11, E13, G00, G02, Y00, Y11). Sentiment is laser cut wood words, colored with the G02. Thank you for taking some time to take a look at my card. I wish it will inspire you to play with stamp too today ! See you soon for another project and have a great day !